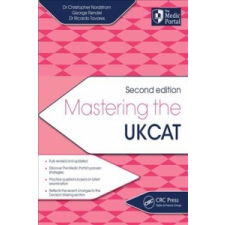 Van véleményed a Mastering the UKCAT – Nordstrom, Christopher (The Medic Portal, London, UK), Rendel, George (The Medic Portal, London, UK), Ricardo Tavares termékről? Értékeld! Tedd fel kérdésed a(z) Mastering the UKCAT – Nordstrom, Christopher (The Medic Portal, London, UK), Rendel, George (The Medic Portal, London, UK), Ricardo Tavares termékről!